Goni is a small town lying among the Sardinian regions of Gerrei, Trexenta and Sarcidano. In this area it is possible to find several traces of prehistoric human activities which testify the presence of human settlements dating back to the Palaeolithic era. The archeological Park Pranu Mattedu rises in this territory. It has a whole extension of 200.000 square metres, and is ranked as one of the most important funerary areas of Sardinia. It is a monuments ensemble rich in menhirs (about 60) and hypogeums and dome tombs, probably dedicated to the elderly worship and to civil practices, in particular the funerary ones. 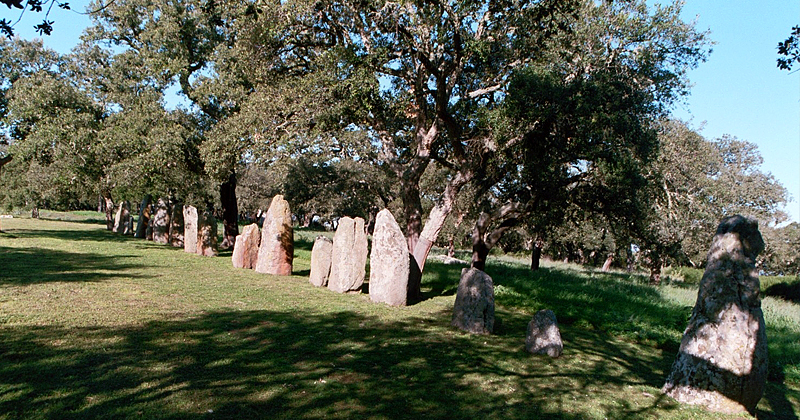 The menhirs are here situated as alignments on the East-West Equinox line: the most important is an alignment made up by 20 menhirs, in threes, in twos, or rarely isolated. Some are also set in front of the tombs of the site. The tumulus tombs (those which were originally covered by a mound), are the most characteristic. They are built by blocks of stones and made up by a atrium, an entrance hall and a quadrangular room, whereas the perimeter wall has a round shape, often surrounded by wider rings. There are also other kinds of tombs, Domus de Janas, which are finely carved in the rocks. Not far from the built-up area, there is Peinconi site, where it’s possible to see many fossils, which testify that this area was one of the first settlements of living species in the history of the world. The study of these fossils (Graptolites), belonging to extinct marine organisms, made this town a famous destination for scientists coming from all over the world. Goni is a perfect setting for naturalistic tourism because of it natural beauty: wild hills, uncontaminated luxuriant maquis, thick growth of myrtle. Goni is also a very important centre for cork handcraft and for the production of traditional baskets.